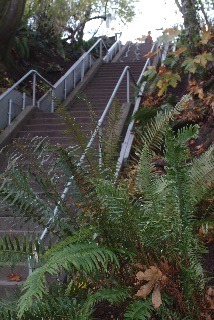 A north Beacon stairway to be improved at this weekend's Earth Day Work Party. Photo by Vicki Grayland. Sound Transit is hosting another Lunch Bus trip at 11:30 am on Friday, April 17. The Lunch Bus is a guided tour of the Link light rail initial segment construction, followed by lunch at a local eating establishment. You are responsible for buying your own lunch. Tours depart and return at the southwest corner of 5th Ave S & S King Street in the International District. You must RSVP today — see the website for info. Beacon Ridge Improvement Community is hosting an Earth Day Work Party this Saturday, April 18, from 9:00 am until noon. Neighbors will help clean up and beautify the public stairways at South Walker, Hill and Holgate Streets between 16th and 17th Avenues South. Refreshments will be provided. Please wear appropriate clothing and footwear, and bring tools if you have them, marked with your name (weeders, shears, shovels, trowels, rakes and brooms). Questions? Contact David at bricchair@comcast.net. Interested in becoming more involved? BRIC needs committee leaders and board members. See David if you are interested. Want to get an up-close look at the SODO, Stadium, and Mount Baker light rail stations, peek at the Beacon Hill Station area, tour the changes on Martin Luther King Jr. Way South, and view the new trackway in Tukwila and near the airport? Sound Transit is hosting another “Lunch Bus” on January 16. It’s a guided tour of the light rail project areas, with a stop for lunch at Thai Recipe Restaurant. The cost of lunch is $10. Details and RSVP here.